Who is your child’s favorite Disney character? Elsa? Moana? Peter Pan? Kylo Ren? What about some of the more obscure characters? Anyone got a kid whose favorite character is Basil, the Great Mouse Detective? Maid Marian from ‘Robin Hood’? The Mad Madam Mim, featured in ‘The Sword in the Stone’? What to do when your child’s favorite Disney character isn’t heavily featured in the parks? This was a question I found myself contemplating recently. It’s my fault, really. We were on the 46296th view of “Frozen”, and I just needed a break. After a quick scan of our Disney movies, I suggested an old favorite of mine. And the rest, as they say, is history. I’ve got two little ladies who are absolutely obsessed with Alice. They spend their days eating cookies that make them big, drinking potions that make them small, they sing with flowers, they chase white rabbits, and they’ve taken to bossing me around while calling me ‘Maryann’. Now I’ve got two little Wonderlanders who are going to Disney World and demand to do every single Alice related thing that the most magical place on Earth has to offer. At first, I was a little concerned. I could think of Princess attractions, Star Wars experiences, but Alice in Wonderland? I was a little at a loss. 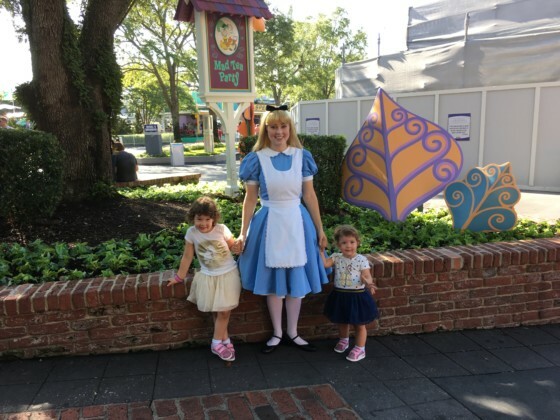 I knew she was an occasional presence in the parks (we met her last trip) but could I create an afternoon that revolved around Alice? With a little bit of a tumble down the research rabbit hole, I discovered a wonderland of options to keep my little Alice devotees happy. Meet a Wonderland Friend at the UK Pavilion, Epcot: The sole Alice experience at EPCOT, though you can find many Alice themed merchandise items in the UK pavilion shops as well. Alice can be found outside throughout the day to meet, greet, and take a few pictures with her friends. Meet Alice at the Mad Tea Party: Another Alice meet and greet outside, this one takes pace near her iconic ride, the Mad Tea Party, and across from the Cheshire Cafe, the Wonderland themed snack hut. On our last trip, this was our absolute favorite character interaction. Alice has a lot of opinions to share on cats, flowers, rabbit holes, tea, queens. Go with a few questions ready, but know that she’ll have some questions of her own. After all, she is curiouser and curiouser. Ride the Mad Tea Party: Otherwise known as the teacups, this iconic ride features the voices of our favorite Tea Party attendants, as guests spin in brightly colored teacups around the Doormouse hiding in the teapot. The line for this moves very quickly, since it loads and unloads quickly so even if you on’t have a huge Alice fan in your party, you’ll probably ride these teacups more than once. Keep your eyes peeled, because every now and again you can spot Alice riding the teacups herself! Have a Cheshire Tail at The Cheshire Cafe: There are some delicious treats at this snack stop, including cold brew coffee, lemonade slushy, and s’mores pie, but the star here is the Cheshire Tail, a treat you can only get at this spot. A soft pastry stuffed with chocolate chips and cream fillings, with a sweet, colorful icing in the colors of the Cheshire Cat. For those of you on the dining plan, the Cheshire Tail counts as a snack credit! Supercalifragalistic Breakfast at 1900 Park Fare: Don’t let the title fool you. Sure, Mary Poppins is the headliner here, buy you also get to enjoy your breakfast with two, TWO!, citizens of Wonderland. Alice and the Mad Hatter will be on hand to ask you how you’re enjoying your breakfast tea. Seeing Alice at a meal is a treat, because she comes to you while you munch of Mickey Waffles, but the Mad Hatter is something else all together. This hilarious hat expert appears sparingly throughout the park, and here you get an audience with him. The fun doesn’t just stop at your table, though. The Mad Hatter and Alice keep the meal lively by making jokes across the room to each other and playing around. The Supercalifragalistic Breakfast is located at 1900 Park Fare, in the Grand Floridian Resort. The Grand Floridian is a beautiful, fairy tale looking resort featured in my many Disney advertisements. It’s not quite Wonderland, but it is beautiful. Take a few minutes to stroll the grounds and check out the gorgeous, elegant resort. Check out Alice and the Mad Hatter in the Festival of Fantasy Parade. This 3pm (2pm in some seasons, always check your schedule before you go!) parade at the Magic Kingdom is a fairytale lover’s dream. All your Disney favorites are there, including the big showpiece, the fire breathing Maleficent dragon. But keep your eyes peeled towards the end of the parade, because right before the finale of Mickey and Minnie in the balloon, you’ll see Alice and the Mad Hatter, walking the parade route. Because these two are on the ground, and not on a float, there is an opportunity to interaction. The Mad Hatter is especially chatty with parade viewers. Wonderland Tea Party. If your pack of cards are aged 4-12, they can enjoy this unique, interactive character experience at 1900 Park Fare. The Wonderland Tea Party lasts an hour, and kids are treated to some serious quality time with Alice and the Mad Hatter, “tea” (juice, really), games, stories, and cupcake decorating. They’ll even have a chance to make a craft souvenir they get to keep. There is a party size limit, so your tea partiers will get some great face time with some fun characters in a truly special environment. While parents are asked to wait elsewhere on Grand Floridan grounds, there are PhotoPass photographers there to capture this amazing experience. Have you done any of these Alice activities? Did you love them? Super love them? Do you have an Alice centric activity that I missed? Any other characters you’d like us to feature next? Tell me every single thing in the comments!